Not much to add to the hundreds of reviews of HP 21 across the globe. It's good, made even better by the fact that I secured this dram when the "KGBO" (thanks Nozinan) had HP21 at 38% cheaper than its current list price. In a bizarre and inexplicable move, they even lowered their standard price by $50, which is why I grabbed it in the first place. Worth it. Nose: soft honey and peat, wisps of sweet smoke, light grassiness, vanilla, and butterscotch. Palate: sweet arrival. Honey with faint peat and smoke, bread, then develops into lightly spiced honey and imperceptible peat. Finish: sweet, light peat. Herbal, grassy, and drying in that pleasant HP way. There is a recurring and pleasant tannic spice once all has subsided. I have done my own HP Vertical tonight. First the 12, then the 18 and now for the 21. I was dubious before I'd ever tried Highland Park as I had heard mixed reviews on the12. Not to fear, I love it and the 18 was wonderful. The 21 takes it on a bit to the next level. The nose gives orange peel, grass, malt, cereal, and a dusty smoke. The palate offers caramel, it is thick and creamy, salt, orange, apple, peat, oak, slightly smokey and spices sultanas. The finish is long, spices, pepper, and aniseed. It has a drying quality not found in the 12 or 18. I could drink a lot of this very easily. It is not quite as easy drinking as the 18 but that's because it's bigger and better. @rigmorole That's a real shame. Mind you, if you can get the 18 it's not a million miles away and much more reasonably priced. Maybe if Scotland vote for independence later this year they might stick export restrictions on and the UK might be in the same boat. Lol. I'm sure I'll get slated for this but I personally think HP 12 is one of the most overrated whiskies our there. It's a nice pleasant dram alright, but I don't think it's good enough for the attention it gets. The main reason I mark it down is it is bottled at 40% and I'm pretty sure it is chill-filtered, (correct me if I'm wrong there). If they just upped the strength to 46% it would be a massive leap forward. It's a long time since I tried the 18yo but I felt much the same about that - an excellent malt that would benefit so much more by cranking up the abv and giving it more body. Anyway the one I'm reviewing today is the 21yo which was one of my favourites at Manchester whisky festival last month - it meant I had no choice but to part with my hard-earned and take away this bottle. Thankfully bottled at a more respectable 47.5%. I recall one of the longest finishes I've ever experienced in a whisky so let's try putting it into words. All notes without water. Nose - woah, initial alcholic blast of grapefruit and peaches. Don't remember that - maybe needs to settlein the glass for a few mins and warm up. It's a cool evening here and the whisky is a touch below room temperature.... Now we get a warming nose of orange chocolate. Mixed in with zesty mandarins. This is more like it! A bit of honey in there. Even a touch of fruit flavoured boiled sweets. And after about 15 mins in the glass I can now detect smokey chocolate. Excellent stuff. Smokiness is much much more apparent on the palate. First I get a continuation of the smokey chocolate but this then gives way to intense, (by HP standards) peatiness. 2nd sip reveals much more in the way of gentle citrus, and a hint of peaches. 3rd sip onwards returns to the warming chocolatey flavours - smokiness still apparent but not dominating like it did at first. Finish - starts off with smoke. This then very slowly dries leaving a touch of fruits and an ever growing astringency. Orange notes still linger some five minutes after the last sip. And I think this is what I remember - intense flavours still apparent so long after tasting it. A lovely complex malt but it needs time and lots of it. I would say spend a minimum of 20-30 mins with a glass before sipping - it really does open up over time. In fact I've just nosed this again some 45 minutes since pouring and it has developed a strong toffee edge. If I was to nitpick I would say bottle at cask strength. There's also no word about non-chill filtration on the bottle and I really think any whisky at this price and age should be done justice by tampering with it as little as possible. A great review with good insight. I thought the HP18 is great so would live to try the 21. After three nice Scapa, let us remain on Orkney for a little while longer and enjoy a few Highland Park. The five samples on my desk are rumoured to be all of very high standard. Next to this 21 Year Old, I also have the 25 and 30 as well as two Indies. But first, the Highland Park 21 Year Old. The nose is a bit aloof and somewhat sweet on all kinds of fruits. Pears, banana, cherries and gooseberries. Loads of heather and hay. Roasted almonds and sultanas. Apfelstrudel. Slightly floral, but very, very nice indeed. Sturdy and oily on the palate, which took me a bit by surprise after the soft nose. Citrus fruit, from lime to bergamot. Walnuts, heather and honey. The peat gives it a smoky edge. Very tasty. Ginger is the leading spice. Honey comes to the fore. Gains power. The finish is long and warm and fades beautifully. Excellent HP. Around 115 EUR, which I will gladly fork over in in this case. First vapor: Cherries with cinnamon honey. Nose: A milk chocolate Toblerone, with woody cinnamon and orange. A little time brings some vanilla peach syrup and floral notes. Palate: Sharply sweet honey entrance. Accompanied by orange peel or ginger. Kept in the mouth, it becomes thick heather syrup, and then strawberry jam, accented by cinnamon and ginger. Finish: A bit of ginger heat over a lightly sweet latte; and remnant floral strawberry. Later, cool anise in the cheeks. Now we're making a statement. Compared with the 12 and 18 (see my other recent reviews), this 21yo not only brings character but delight as well. A changing aroma that is sweet and interesting at each stage; a smooth entrance; a syrupy palate crescendo; and a finish that is happy to sit without biting back. If I were to gripe, I could ask for deeper flavors or perhaps a tad higher strength. For example, the 21yo is still not quite at the level of the 30yo, which adds a different set of aromas and flavors: more vanilla, cinnamon, chocolate, and richer fruit. But I am not griping, because the 21 is excellent. Interesting perspective; seemingly undone by popularity. Re: HP18, I am so far jealous of those who seemed to enjoy it so much. As I wrote in my review of the 18, I saw nothing in it. So I'm starting to suspect I had a batch below the bell curve. Based on my current knowledge, the 21 is just a nudge up in price but a big leap in quality. Tonight I cracked open yet another sample that I received from a friend in Queensland (Thanks Systemdown!). In less then a week my wife and I fly out to Scotland to meet with my brother and experience the whisky adventure of a lifetime. In lieu of this I'm actively trying to get caught up on as many of my samples as I possibly can (it's totally not going to happen since I have more then 30 samples to work my way through) but I'm making the effort. I'm specifically making the effort as I tend to buy only whiskies I've never tried before as I'm always looking to expand my whisky experience. However I'm always looking into whisky distilleries as possible candidates of grabbing something out of their range that I've never tried before. I love the Glenfarclas 10 year old and 12 year old and I really enjoy the 30 year old, heck I just might buy the 40 year old when I'm over there (I think I really will to be honest) but you get the idea. Why buy something that I've already tried when there are so very many whiskies out there that I've not met? Tonight I decided to crack open the sample of the Highland Park 21 year old that I'd recently received. I've enjoyed the 12 year old, haven't owned a bottle yet, had mixed encounters with the 18 year old ranging from "What is everyone going on about" all the way to "that's lovely!" so I figured I'd give the 21 a shot. It doesn't hurt that my sources have informed me that Highland Park is running out of older stocks and within a couple years time the 21 and older expressions will become more and more rare and more and more expensive until the whiskies now aging become old enough. I figure if I might like an older Highland Park, NOW is the time to find out when I can stick pick up a bottle for a reasonable price as opposed to blowing up my bank account in a few years time or punching myself in the arm because I've discovered the beauty of an older HP is. So when I came home out came the glencairn, out came the pizza and salad along with a good movie and my wife and now it's time to explore! First off this is a big complex nose. Screw that this is a big complex whisky, it needs time to open up and breathe, but once you let it, whoa baby look out! Initially when I poured the sample into the glencairn it was mainly heather, smoke, cinnamon and leather, but given 30 minutes or so the transformation was beautiful. Vanilla popped out of the glass along with orange peels, cereal, toffee, honey and quite a bit of dark fruit, specifically sultanas. The smoke, cinnamon, heather and leather are all still there, but now it's like the aromas are swirling in amongst one another. First sip was initially quite charcoaly with peat and smoke, but once more given time to open up this whisky eventually shows it's true character in a way that can only make you smile. Heather, slightly herbal at times, cinnamon, cloves, peat, leather, again the red fruits, this time I'm getting cherries, and faintly some mild chocolate. This whisky starts off smokey and then becomes beautifully sweet and balanced. A very long, lingering finish, honey and orange peels ends the whisky and it keeps going and going and going. This whisky is like a lover. If you're hurried and rushed you're not going to have a very good time. If you push, poke and prod and try to hurry things along you're just going to wind up getting shot down and going home unhappy that night. However if you're kind, gentle and patient you're VERY well rewarded for your efforts, leaving you to go to bed with a giant grin on your face. However all this beauty does come at a price. I've never seen it for sell here in Perth and from the prices I'm seeing online if I did see it I'd expect to pay between $200 and $250 for a bottle. Is it worth it? That's up to you to decide however I can tell you that after this experience I might come home with a bottle of the 21 year old and I'm going out hunting for the 30 year old while I'm over there in the land of whisky and honey. Same Victor! It was a very nice whisky, about the only thing I would have liked to have seen is a higher abv on it. Personally speaking and I am likely being a snob about this, but when I start seeing the 21+ year old whiskies I'd really love to see them at cask strength. I understand why the distilleries don't do that, but even so. However it looks like I need to pick up a 21+ year Highland Park while in Scotland! Sounds great. I've never seen the 21 yo offered for sale, but would certainly love to taste it. I've been drinking this 47% HP 21yo for three years from miniatures, simply because there was limited availability and the 70cl bottles were not ready for release until very recently. The 5cl miniatures have been a great dram, great balance, consistency and quality. I bought a bottle of the 70cl and have a different experience. The nose offers a consistent malty honey, toffee, orange and sea salt aromas. The taste though I found unbalanced and not as layered or complex as previous offerings. There's no truffle oil texture of former releases and this really doesn't have the complexity of what I'd expect from 21 years of ageing. This didn't take water well and remained limited without any real surprises. This is a £100 bottle of 21 yo single malt but I've had whisky at half the price twice as better. The Talisker 18yo for example blows this away for smoothness and complexity. I would also expect a single malt at this level to be free of caramel or colouring and be non chill filtered, and really felt that this is a well marketed tourists whiskey and not for purists.. Pleasant but underwhelming. I don't like it, or I don't like it as much as the rest of you. Maybe it's like seeing ac/dc or Barcelona FC in that you prepare yourself and then instead of blowing you away you just really enjoy yourself. And I did enjoy myself - i've always waited for the very bottom of the bottle in case there has been something that i'm missing. But there isn't - it's just not as good as you guys say it is (to me). Sorry all, must have hit the enter button before i'd finished typing? I've no idea how to edit...good but not great, made me a little sad. That is sad; this is one of my "nice to dream about" whiskies. Did you get a bottle of the 40% ABV version instead of the 47%? This is the new bottling released at 47.5%. Nose: Initially quite bland but after a couple of minutes it picks up, very dark, not very sherry sweet instead lots of notes of heather, old leather bound books, dark honey, toffee, shades of camp smoke, deep stewed fruits, some cinnamon and maybe a note of orange peels. If I could smell how a whisky felt this one would be brooding. Finish: some fine milky coffee, orange peel oils, deep dark honeys. Yum, A bit different to the 18yo, took a little getting used to in a sense that it's very complex and took a while to dissect it, BIG fan of the decision to up the strength back to 47.5%. This is a whisky to take your time with. Couldn't agree more, it is a very nice whisky. And much better again now that it's straight is back up to 47.5%, the old 40% version while still nice and similar in taste was a bit flat by comparison. 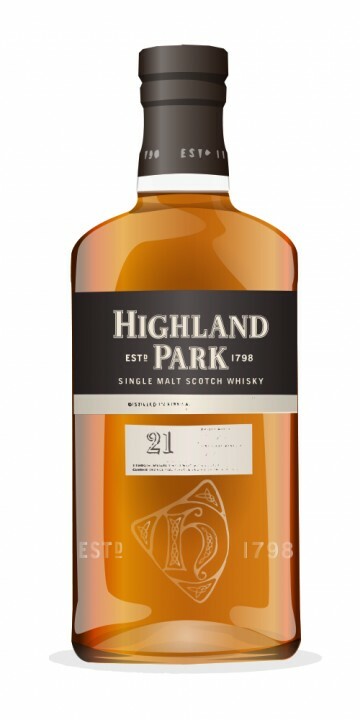 I've been buying the 5cl of this 47.5% for three years now and love the complexity and balance... will be acquiring this new release soon..
Highland park 21 year old , 47.5% ABV , £91 Nose : Wood, citrus as in orange peel , cinnamon And spice , heather and sultanas , honey ad nuts. Old books in the library. Very rich sweet, and not lacking complexity. So much to explore there. Palate: Starts spicy and gingery, then off to milk chocolate , some peat smoke but very distant. Heather , Oak and stewed fruit. Finish: Peat smoke, orange peel covered with milk chocolate and cherries. This is a wonderful dram, complex, rich and rewarding, with a lot to explore every time you sit down and sniff and sip. If you are a fan of the 18, this is a notch better in my book. Things don’t come much better than this. Highland Park fans, and whisky fans, if you can afford this, it’s a no brainer.Great stuff. Nose: Quite floral, peaches and syrup, green apple, orange juice, lightly toasted oak, iced tea, a little honey, a touch of amaretto. The sherry that is present is fragile and almost disappears with water. Taste: Oak, honey, pepper, ginger snaps, rose water. Do I detect a bit of soap? Finish: Orange zest and ginger, assertive oak. That faint soapy note returns. Very faint peat. This 21 year old is very floral and lacks that pronounced Orkney peat, which to me is out of character for Highland Park. Additionally, that soapy note keeps me from falling in love with it. It seems that this one didn't strike me as much as it did other folks because I know that a lot of people love it. @Dellnola, I am interested to hear whether that soapy taste fades away over the next 3-12 months now that the bottle is opened. Soapy taste is the kiss of death ruin of a whisky for me. No whisky with much soapy taste could ever rate better than a 75 for me. But sometimes the soapy taste goes completely away after the bottle is opened for awhile. Unfortunately, this review is from 5cl bottles (the only way I can find the original strength) so I won't get to experience that if that's the case. To make sure, I used the remaining measure from one bottle and the beginning measure from another, and the result was the same. The soapy taste is very faint, however. Faint enough to earn a score of 87, however, we all have different tastes. N:.initially swetness, hint of chocolate, baked apple, You can find the butter and than caramel. P: cremy, spicy chocolate, hint of peat. F: orange peel, smoke. Long.